This is the second notebook I’ve made, and I’ve used my own photos taken over the years, which cover the different seasons. 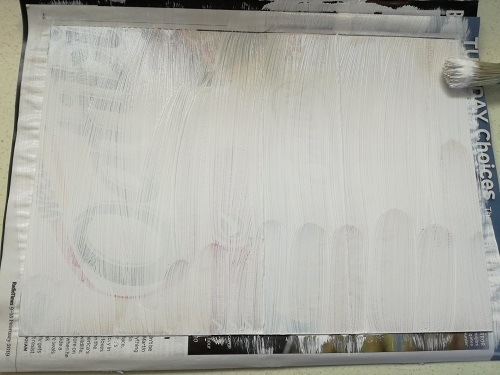 Like the previous one I made, the cover is, again, a cereal box cut to size and covered with gesso and then painted. The paper I use is 200gsm, which is sturdier than standard copy paper. For extra pockets, I used 3 A5 envelopes with the ends sliced open and popped in 4 mini notebooks which I made up with index cards as pages. After my last gaffe with the misaligned signatures, I decided to go with just the one signature. The only problem was, with the number of pages I had – 18 sheets of 200gsm and 3 envelopes – it was a bit of a struggle getting the needle through all the pages. Having said that, I quite like the one-signature look. In total, there are 42 pages (including the 3 envelopes). The overall notebook measures 7.4” x 5.3” (about 18.8cm x 13.5cm), and the mini notebooks are 3.1” x 2.4” (about 7.7cm x 6cm). I’ve decided to add another day to my blogging week, mainly for things like craft, music and fun stuff, kicking things off with notebooks. 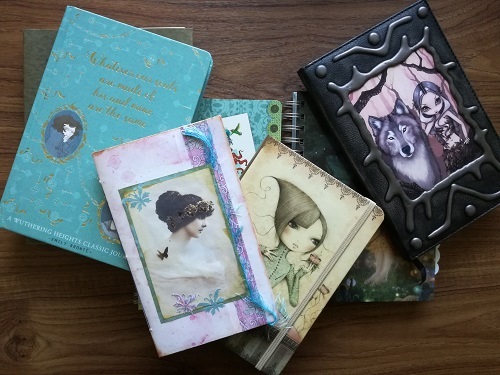 There’s a huge plethora of notebooks and journals, especially junk journals, on places like ebay and Etsy, not to mention the countless number of videos on Youtube on how to make them. It’s no secret that I am obsessed with notebooks. It used to be stationary in general. One of my earliest memories as a toddler is being mesmerised by a tin of brand-new colour pencils! My sister still occasionally reminds me of my constant refusal to let her use my colour pencils. And we’re talking well past toddler age here! A very small selection of my bought notebooks except the small one on the top of the pile, which is an earlier handmade attempt. The many talented people out there who make journals and notebooks, they either keep for themselves or sell, and they are gorgeous, filled with so many elements. I love those and would buy a shedload, but – and ain’t there always a ‘but’ – I know myself well enough to know I will not use them. Yes, I know I have notebooks from way back which I have yet to use, but I am getting better at, slowly but surely, using them. I can think of at least two reasons why I wouldn’t use the handmade ones. Apart from the obvious use of paper, many have cloth elements including ribbons and lace, and the page sizes vary. Because of that, I know I, personally, would find them too distracting to write in. And because some are almost like works of art, I wouldn’t want to ‘mess’ them up by writing in them, if that makes sense. So, as a writer with a notebook-obsession, I’ve decided to make my own notebooks, taking inspiration from what’s out there, but without the many diverse elements. Apart from being easier to write in, I know I won’t find them distracting and I won’t have any hang-ups about making a ‘mess’. I bought the design elements for this notebook from a wonderful online shop called Creative Market. This particular design is called ‘Born to Be Wild’ by Veris Studio. The cover is a cereal box, cut to size. I covered it with a couple of coats of gesso and left it to dry overnight, then dry painted over that. I do not know how I managed to mess up sewing the signatures to the cover! I measured, checked at least twice, marked up the cover, checked again, but still managed to get it wrong. I must be growing up – instead of getting in a tizz, I had to laugh. It’s so ‘me’, it’s unbelievable! Despite the wonky signatures, I’m pleased with my notebook. And I’m about to make another one, this time using my own photos covering the 4 seasons. I’ll post pictures of that one in a later post.